Personally, I’ve no idea what Bitcoin, Ether, Ripple, Litecoin, Dash, or any other cryptocurrency’s actually worth, esp. in the wake of such astonishing gains. [Not to mention, their prospects for success/survival – look at Bitcoin, its crypto market share (& see here) has halved since early-2016!?] But that’s not an indictment, I still have the same problem with gold – God knows what it’s really worth, despite being around for millennia. So for now, cryptos are just trading sardines for me…at least in terms of price. But I do believe in the blockchain – particularly, the Ethereum blockchain – as a foundational technology, with huge potential to disrupt/exploit the massive revenue & profits exchanges, brokers, intermediaries, middlemen, custodians, record-keepers, etc. now hoard & enjoy for themselves globally. Therefore, I believe investing in blockchain companies & projects is now far more compelling. But it’s early days yet, we see the original blockchain already losing ground to Ethereum’s smart contracts blockchain, and we should presume continued evolution & radical new developments to come (as with any new technology). And while Fortune 500 CEOs now boast about their blockchain experiments…what happens when real-world applications pose a serious threat? Do they try to kill the blockchain, persuade the world to accept limited/private blockchains, co-opt blockchain benefits & savings for themselves, or will they be forced to reinvent themselves to try defend (or even expand) their turf? Just remember, the latter’s far less common than you might think…it’s nigh on impossible for conventional CEOs/large listed companies to pull the trigger & cannibalise their existing business. Inevitably, they freeze in the headlights, ’til they finally launch a huge/extortionate acquisition binge to try acquire & control the competitive/existential threat they face. Now try putting all that together – then start mapping out the possible scenarios, risks & opportunities which may lie ahead for the sector!? God knows how the winners & losers will shake out here…a diversified approach is essential. But barely a handful of listed companies are now developing their own blockchain applications & technologies. [And they’re akin to venture capital investments anyway]. Which points me towards listed investment companies which are now building venture capital portfolios of blockchain companies (via traditional equity/convertible/preferred stock investments). Plus companies focused – albeit, more cautiously & gradually – on making similar blockchain investments in companies & projects, via initial coin offerings (ICOs). The latter may surprise you, considering some of the more alarming ICO headlines you’ve probably seen in recent months… But fools & fraudsters are always pervasive in new asset classes & investment themes – it’s silly to presume they’re somehow unique to ICOs. And simple due diligence invariably weeds out the obvious frauds & failures. While recent/looming regulatory threats may just be noise – this is a radically new approach to seed/venture capital funding, and it won’t suddenly disappear in the face of regulation. ICOs may choose to take advantage of regulatory work-arounds, to simply ignore Chinese & US regulators, to reject US funds & citizens (as we already see with banks, brokers & investment bankers globally), to embrace further regulation & seek out accredited investors, etc…on balance, more regulation may deter some existing crypto-enthusiasts, but it’s also likely to open up the sector to a far larger pool of global investors. Attention should focus ultimately on what ICOs offer in terms of an economic stake & upside potential. Again, the headlines can be misleading: Many promising/heavyweight projects don’t offer an explicit securities interest – so should be outside the SEC’s (perceived) remit – as they may not even be companies, and are often open-sourced anyway. [Making them unattractive to regular VC firms]. Instead, they offer participation via the upside potential of utility tokens, which are essential to/derive increasing value & demand from the successful functioning/scaling up of the underlying project. Hence, initial coin offerings are now being called token sales. Ideally, it’s all about investing in/exploiting/benefiting from global platform economics & network effects – something hard to imagine little more than a decade ago, but which globally the largest technology firms & unicorns are now built on. Picture Facebook with no shareholder, where its net revenue/profits belong to its most important stakeholders – i.e. its users: In such a scenario, Facebook Likes could well have become the most valuable utility token in the world! All I wanna do is have some fun…flipping ICOs! Which inevitably leads me to Kryptonite 1 plc (KR1:PZ). Formerly Guild Acquisitions plc – a tiny Bruce Rowan-backed vehicle that was dying a slow death. In July last year, the directors finally threw in the towel, announcing a small £0.1 million placing, a new blockchain investment strategy, and George McDonaugh as CEO. [A deal sponsored by Rupert Williams & Jeremy Woodgate, of Smaller Company Capital, who were also appointed as NEDs]. By year-end, the company changed its name, and announced two more small placings of approx. £0.3 million, its first venture capital investment (£30K in NOMAN Ventures Limited), and its first initial coin offering (£6K in SingularDTV). In the space of just 7 months, the company’s fully/partially exited 4 different ICOs at an average 15x exit multiple! And that’s just part of the story, Kryptonite’s also racked up some astounding revaluation gains. ‘Cos flipping ICOs is so flipping easy! Clearly, that’s appropriate…it would be silly to presume the Kryptonite team’s just throwing darts here blindfolded & hoping to strike it lucky. Let’s not forget, there’s 1,000+ cryptocurrencies already, with new ICOs arriving almost every single day! [As I said in my last post, even dabbling in ICOs would be a full-time career. Ya gotta outsource..!] Now take a look at the ICOs in which they’ve actually participated (see below) – it’s clear there’s a comprehensive due diligence process in place to evaluate them. The most critical hurdle is to first eliminate the obvious frauds & failures. Then, most important, you assess the calibre & reputation of the team/management leading the project/company…as with all start-ups, their ability to pivot could be critical. Next, focus on the underlying project/technology/application: How difficult is the implementation, how innovative the technology, what’s the potential timeline, scale & commercial opportunity, who else is targeting similar applications & space? Ideally you want a credible team, an exciting project, and an empty space to exploit. Finally, evaluate the crypto economics – both the short term supply/demand dynamics, plus longer term utility/demand/inflation/store of value potential of the token. All its gains are actually tax-free! Firstly, because I got my start (& my first serious returns) as an investor flipping IPOs. [Or stagging IPOs…as it was called back then, when it was actually an accessible & lucrative strategy for private investors. Maybe a future post, eh?!] I also had a ringside seat on the dot-com bubble – and skipped the collapse – so all I remember is how irrational a real bubble can truly get. Today, I see the same story playing out: A new & ultra-hot technology sector, investors playing free & easy with house money, blind faith in what seems like guaranteed returns, privileged friends & family allocations, lock-ups, severely limited free floats, etc. And today, there’s a wall of cryptocurrency effectively trapped out there – investors fear missing out on gains, they don’t want to return to fiat currencies, plus they want to avoid the risk of a huge tax liability. But money’s always looking for another rally, which can become self-fulfilling… And with many new tokens held back – by lock-ups, by the founders, by the project/company itself – subsequent trading can see a huge initial pop, then a steady ratcheting higher. And despite the absence of the usual gatekeepers (i.e. investment bankers), it’s becoming far more difficult for small investors to now participate – they don’t have the access, or the speed. Which can mean a wall of money chasing through a very small door, and investors often feed this momentum because they’re perfectly happy buying tokens at 3/5/10 times the ICO price (as long as they’re convinced it will soon hit 20/30 times the price). And this phase may last longer than you think…check your dot-com history: Even four years before the Mar-2000 peak, first day 100%+ IPO premiums were not unusual, while 400-600% premiums were a regular feature of the bubble for a full one/two years before it finally started deflating. So we may see plenty of mileage yet, with today’s supply/demand situation far more extreme – the listed sector’s still only worth $2.6 billion. 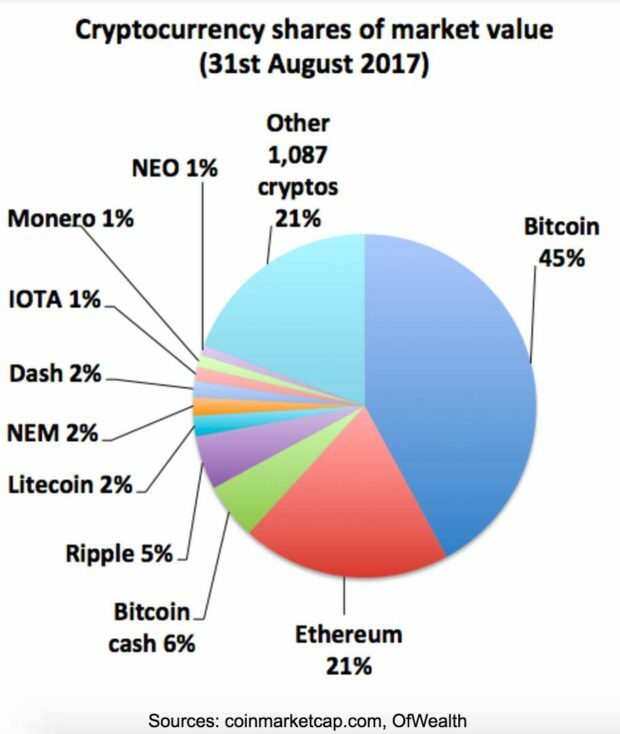 It may have performed handsomely this year, tracking Bitcoin & Ether higher – but in reality, most crypto-guys have yet to consider buying shares, while most share-guys have yet to consider buying crypto. But this will change…a rising tide lifts all boats. So what’s it all mean for Kryptonite 1? Even if we see less eligible ICOs going forward, and premiums start to compress & rallies evaporate, initial supply/demand & classic venture capital economics may still work in Kryptonite’s favour. Picture it buying ten new ICOs in the next year (they actually announced 4 new ICO investments recently) – even if nine are duds (say, a net wash), a single 5/10-bagger could still deliver a 65% RoE (gross)! And all else being equal, Kryptonite’s busy tilting the odds in its favour…ICO due diligence process is still paramount, but its network of crypto-contacts, support/sponsorship of the crypto-community, balance sheet, growing credibility are granting it preferential and/or guaranteed access to ICO seed funding rounds, private/pre-sales, price discounts, bonus tokens, etc. The interim results commentary highlights this nicely. But somebody always wants to kill the golden goose… To alleviate this risk, Kryptonite should also gradually recycle profits into longer term venture capital (& ICO) investments…they may not offer high returns up-front, but could prove compelling in the future. They also have a longer lead-time & may offer a single chance to invest – so even though current ICO returns are incredible, building a VC pipeline is prudent. Kryptonite announced two such investments YTD – both of which look promising – a €59K investment in Jan-2017 for a 1% stake in SatoshiPay, and another £200K investment just a week ago for a 5% stake in Vo1t Ltd (Kryptonite’s their first beta client). Despite this accelerated RoE, Kryptonite’s mostly remained below the radar. Sure, it rallied sharply YTD, like the rest of the sector – but who else can boast a 900%+ RoE in the first half of the year?! And that means KR1’s far cheaper than in my last post – which didn’t include realised/unrealised crypto gains – in reality, at 4.125p per share, it trades on a mere 0.56 Price/Book multiple (vs. a Jun-30th NAV of 7.43p per share). Even with a less attractive future in store, that multiple’s ridiculously cheap. On the other hand, if you think flipping ICOs is a sustainable source of alpha/high returns for some time to come, how on earth do you put an appropriate valuation on a 900%+ RoE, or even some small fraction of that return?! Which implies a 231% Upside Potential, vs. a current 4.125p share price. The entire sector literally trades on a cap weighted average of 20.0 times book. Even removing some ludicrous outliers, we still get a 6.6 Price/Book…which is pretty daunting, because the sector hasn’t delivered anything remotely like Kryptonite’s RoE. Plus, I’m aware some of those P/Bs may be overstated – possibly significantly, like KR1 above – as I didn’t attempt to incorporate potential realised/unrealised crypto gains. Recent grant of 9.9 million options. The options were worth £277K, in terms of intrinsic value – which looks acceptable, as Kryptonite’s expenses haven’t increased much since the new management team arrived, so these options are clearly in lieu of compensation. [In fact, with the surge in equity, the expense ratio’s now an impressive 2.1% pa]. But management should have warned shareholders in advance, and should indicate how compensation will be handled in the future. The July £750K share placing was at 2p per share, a 33% discount to the share price at the time (not extraordinary for a nano-cap). Unfortunately, we now realise it was extremely dilutive vs. a Jun-30th 7.43p NAV per share (since reported). Alas, we need to chalk this one up to management’s learning curve – presumably the placing was in the pipeline for quite some time, a substantial portion of the subsequent ICO gains weren’t evident at the outset, no Jun-30th balance sheet was in circulation, and the placing price made sense vs. the share price at the time. So overall, despite a near-doubling in total equity, we end up with a marginally lower fully diluted NAV of 7.16p per share (though clearly, we’re not comparing apples to apples here). Which is fair warning for management…and shareholders: Personally, I’d be extremely wary of further dilutive placings – it would indicate management is dead-set on scaling-up the balance sheet, regardless of any implied cost/dilution. But why should they?! Management’s execution has otherwise been pretty flawless, they have an incredible story to tell, and underlying RoE bodes well for Kryptonite’s prospects & valuation – now they should hit the road & really start getting the story out there. Which implies a 473% Secondary Upside Potential, vs. a current 4.125p share price. At this point, an obligatory nano-cap warning: I haven’t given one of these in quite some time, as I’ve focused on larger-cap stocks (even Alphabet! ), but Kryptonite’s underlying performance to date & the upside it potentially offers as a unique cryptocurrency/blockchain play is extraordinary. It currently trades on the more lightly-regulated NEX exchange, it still sports a mere £4.0 million market cap, and it usually trades on a ridiculously wide spread (though you can work/close the spread, as I did, if you have the patience). [Plus you need to be able to trade it – here’s one recommendation from the company itself. But a decent full-service broker should be able to help – yes, they’re still useful occasionally – even if they don’t usually trade NEX, ideally they can source stock via a London market-maker]. Clearly, if this go pear-shaped, the resulting spread & illiquidity could be a real killer…it’s no stock for widows & orphans. [What do they know about cryptocurrencies anyway..?!] Of course, it would be remiss of me not to highlight those very same attributes could also deliver an utterly ridiculous price rally/valuation…if a bunch of investors & the message boards really got excited about Kryptonite’s prospects!? But in the end, the company’s actual price/book multiple – either mine, or what the market sets – may not matter all that much. Whether management can keep executing & steadily compounding Kryptonite’s balance sheet (even at a small fraction of its YTD return on equity) going forward, that’s obviously what really matters & what might potentially deliver out-sized future returns. But clearly they’re incentivised – management’s purchased 8.0 million shares to date & now controls a 15%+ fully diluted stake (inc. options) in Kryptonite (worth over £0.7 million). Personally, my investment’s constrained by Kryptonite’s current market cap (& the usual reporting threshold requirements), so I’ll just confirm I currently own between 1% and 3% of Kryptonite 1 plc (KR1:PZ). Hi wexboy I think targets around 25 p for book X 1.84 what do you reckon? But in reality, Kryptonite 1 is NOT a Bitcoin/Ether price tracker. While a BTC/ETH rally is obviously positive for sentiment, KR1 short-term gains have actually been derived from huge multi-bagger gains on new ICOs, which arguably are relatively price independent – i.e. they can potentially harvest a 1,000% new ICO premium whether BTC is at $5,000 or $15,000. As regards the selling, it’s an unfortunate fact of life with placings like that, as the bulk of the shares go to larger/existing shareholders…so in reality most of them flip the shares, as they are comfortable with their pre-existing stake…which is why I highlighting I hadn’t sold any placing shares! Kryptonite 1 actually bought 73.3 million FunFair tokens at 0.5p each (a total of GBP 384K). They have reporting selling less than 5% of their holding since (a 4-bagger). Today, the rest of their holding would now be worth GBP 2.9 million (at 4.1p per token, an 8-bagger). Well thats what happens when u dont pay attention to detail and miss a decimal place! What’s your view on their latest (and by far, largest) investment – Web3’s Polkadot Project? With Kryptonite’s balance sheet/NAV a huge multi-bagger in the last year, they’ve naturally been scaling up their investments, so the size of this investment is no real surprise. As for Polkadot itself, the team/backing is impressive, and it appears to be an obvious foundational infrastructure project for a rapidly proliferating crypto/blockchain universe – which, of course, is endorsed by the fact there’s also other teams/projects out there with similar/related objectives (inc. Cosmos, in which Kryptonite also invested). While I think there’s easy multi-bagger profits to be harvested here now from new ICO launches, handicapping the odds of success for longer term ICO/blockchain investments is obviously challenging. But as any good VC would recommend, betting on the right people/teams almost inevitably proves to be the most important criterion – while a diversified portfolio’s also essential, where hopefully one big winner (/unicorn) can hopefully yield huge returns despite other losers in the portfolio. Cheers – any subsequent/further feedback on Polkadot, feel free to share it here, or email me. Thanks. Coin pushing on today, KR playing slow catch up, As we are aware , The potential in the sector is still to become clear figures wise , GMc will have his targets and if it’s anywhere near last 8 months , Anything is possible even unicorn status. AS you state in your summary the figures are staggering so is the ablove a realistic projected mc based on the last 7 months growth and returns on investments made in CC ICO,s ? The crypto/blockchain space is moving so fast who knows where we’ll be in a year, and I’ve no idea where Bitcoin will end up (in terms of its value vs. the dollar), but I definitely like Kryptonite 1’s investment strategy, particularly the specific & pretty unique exposure it offers to the sector. If the company can continue to clock up even a fraction of its YTD return on equity, it more than deserves to trade on at least 2/3 times book – which would still offer a cheap ground-floor entry price to a sector that trades at much higher multiples on average – hence my 13.7p & 23.6p price targets (vs. 6.875p per share today). On the other hand, if Kryptonite managed to continue racking up 100/500%+ RoEs for some time, NAV & the share price could potentially compound to price levels that are a multiple of my FV targets (but please note, I’m not suggesting anything remotely like 20 pounds per share). If that happens, then yes, all my Christmases come at once – but I’d definitely caution you (& me) not to start counting those chickens just yet! And many thanks to you too, Dave! Thanks, mmi – I’m wondering now if I really should follow through on my promise to highlight/list any new crypto/blockchain companies – they all seem to be ‘change the name/feed the ducks’- type companies, and I’m sure we’ll see more of the same soon! As it is Zamano seems to be going nowhere or worse still stuck in reverse. K could do the takeover (at a nav premium), and utilise the cash funds for their ICO investments or even do a limited buy back of Zamano shares. Yes, there’s def some merit to that idea, and I certainly think about such things! But reverse-merger candidates are mainly unquoted companies seeking a listing, rather than companies trading on a smaller exchange & looking to step up – though granted, a Zamano deal is in theory pretty clean & easy at this point. What do you make of the director links with V22 ? V22 plc was simply another legacy investment of Guild Acquisitions…it has nothing to do with the new directors appointed (since July-2016), or Kryptonite 1 plc. Not to mention, in line with its new investment strategy, that V22 shareholding (which was worth just £17K) was already disposed of last year. Cheers for that sounds quite reasonable. Im presuming Stephen Corran is a typical nominee director thanks for that. I believe i shall stick a few pounds onto supermans enemy! Yes, I think it’s fair to say Stephen Corran is there simply in his capacity as ‘a typical nominee director’ & Corp. Secretary. Good luck! Worrying thing is that when crypto takes a dive this discount can evaporate. Still I think you are right here could be lots more opportunity. Yes, coinmarketcap.com is def one of the better sites – check out the ICO tickers above, they’re actually coinmarketcap quotes/graphs. Frankly, I have no real idea whether Bitcoin’s ‘worth’ $50 or $500,000 (the latest & most ambitious prediction from John McAfee! ), so right now I’m focused on investing in the blockchain & flipping ICOs – which is a pretty unique proposition, in terms of the available listed companies out there (globally, in fact), hence Kryptonite 1. As I highlighted, I think the current supply/demand dynamics for new ICOs suggest compelling profits to be made participating in their sale/pre-sale, regardless of the absolute Bitcoin level, or even whether it’s making further/fresh gains. Of course, if the Bitcoin price did collapse, it does seem likely the new ICO market would dry up…so Kryptonite’s policy of recycling capital & working on its longer-term pipeline of potential blockchain-related investments is prudent. Therefore, please note I’m assigning a 4.7% of portfolio deemed weighting to my Kryptonite 1 holding for performance purposes. *There was an old one (KR1. ), but I’m guessing nobody could find it.